Children's Pre-School Center is a non-profit child care center in Palo Alto, California. We support working families by partnering with parents to provide top quality child care through a carefully designed child development program that helps children on their journey toward confidence, competence, intelligence, and creativity from infancy to pre-Kindergarten. CPSC provides an environment rich in national and international cultures with parents and teachers who work together to cherish and celebrate the children in our care. Every educator I've met has shown dedication and compassion for the children in their care. CPSC provides an environment of communication and learning among educators in which they meet to share ideas for lessons and different approaches for teaching styles. It's great to see so much compassion for creating the warmest, most stimulating environment for our children. I also love the sense of community among the educators and parents. Picking up or dropping off my daughter is always a positive experience. The parents and educators care about each other. I've made more friends here than in the other center our daughter has been in here in Palo Alto. CPSC has provided a warm, loving environment for our daughter. We couldn't be happier! She has been in the junior preschool program for over a year now, and has flourished socially and intellectually under CPSC's care. Preschoolers and their families face many developmental transitions at this stage, and I am thankful for the patient guidance and support provided by CPSC's experienced Director and Staff, who greatly facilitated us through potty-training, early literacy and communication, and self-help skills. We are very proud to be part of the CPSC family, and look forward to enrolling our second child next summer! I can’t begin to express what CPSC has meant to our family. Kaela’s first day at CPSC was March 31, 2003, when she was just 15 weeks old, so she has been here exactly 5 years, 4 and a half months. We have been a part of 7 wonderful classrooms. Although each classroom is unique and special in its own way, all of them have been exactly the same in one very important regard: the genuine love that every teacher at CPSC has for our children. And, that is what our family will remember and cherish the most about our years at CPSC for the rest of our lives. Kaela absolutely loved coming to school at CPSC. Every day she has been challenged and stimulated to grow and learn in a supportive and caring environment that has always valued her as an individual. Our whole family is tremendously grateful for a child care center as amazing as The Children's Pre-School Center. We can't imagine a better place for our children to learn and grow. Our kids have developed wonderful relationships with teachers, students, parents, and other staff members. Most importantly, they are very comfortable with themselves. I think this is because of the warmth and security we get from our community there. We looked everywhere and tried several options, but this is absolutely the best choice for us. We feel extremely fortunate for the opportunity to benefit from the mutual trust and respect we found at CPSC. Our eldest son started at CPSC when 3 months old and is now a senior preschooler. 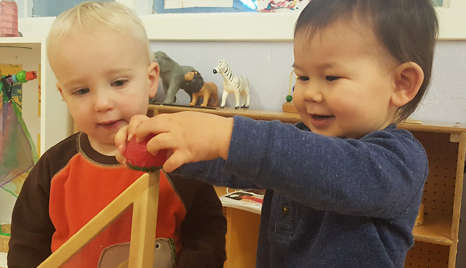 Our second son is in the junior preschool, and our new daughter will join the same infant room her brothers started in, with the same head teacher. Obviously we are very happy with the center. It is a great environment but to me the most important thing when trying to decide where to leave my baby before heading back to work was the people. The director, Rachel, is very experienced, the staff is always friendly and the teachers in all the classrooms we have gone through have been deeply caring towards the children and extremely supportive of parents. Copyright © 2018 The Children’s Pre-School Center. All Rights Reserved.